Lloyd D. Brenner, age 92, of Zelienople, formerly of New Sewickley Twp., passed away Wednesday, February 6, 2019 while under the care of Passavant Retirement Community. Born June 15, 1926 in New Sewickley Twp., he was the son of the late Daniel H. and Katharine Zahn Brenner. Lloyd was a member of St. John’s Burry’s Church and served as a council member and Sunday school teacher. He owned and operated his family’s farm, Brenola Dairy Farms, in New Sewickley Twp. Lloyd was also a former New Sewickley Twp. supervisor and member of the Big Knob Grange, a lifetime member of the Big Knob Fire Department, and a member of the New Brighton Masonic Lodge #259. He was proud to have traveled to all 50 states, Canada, Egypt and Mexico. Lloyd is survived by his four sons, Jay (Betty) Brenner of Jacksonville, FL, Daniel (Joyce) Brenner of New Sewickley Twp., David (Chris) Brenner of Cranberry Twp., and Thomas "Scott" (Fiancee’ Diane) Brenner of Brighton Twp. ; eleven grandchildren; seventeen great-grandchildren, and a sister, Lois Brenner Miller of North Sewickley Twp. In addition to his parents, he was preceded in death by his loving wife of 51 years, Lois Weaver Brenner, a sister, Jeanne Brenner Bonzo, and an infant granddaughter, Shelby Brenner. The family will receive friends on Sunday, February 10, 2019 from 2-4 P.M. & 6-8 P.M. at the Boylan Funeral Home, Inc., 324 E. Grandview Ave., Zelienople, PA 16063. Additional visitation will be held on Monday, February 11, 2019 from 10 A.M. until the time of the funeral ceremony at 11 A.M. at St. John’s Burry’s Church, 1835 Route 68, Rochester (New Sewickley Twp. ), PA 15074, with Rev. Richard L. Raines, officiating. He will be laid to rest at St. John’s Burry’s Church Cemetery. If desired, memorial contributions may be made in Lloyd’s honor to St. John’s Burry’s Church. The family would like to thank New Haven Court and Passavant Retirement Center for the wonderful care they gave Lloyd over the past 8 years. To send flowers or a remembrance gift to the family of Lloyd D. Brenner, please visit our Tribute Store. 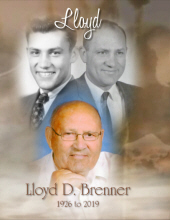 "Email Address" would like to share the life celebration of Lloyd D. Brenner. Click on the "link" to go to share a favorite memory or leave a condolence message for the family.